Understanding the security landscape by developing a strategy and engaging the right partners is necessary to strengthen the security posture. These implementations will help in minimizing the impact of any security event on the business because faster the threat will be detected, the less damage it will do the organization. All the information that we provide are only accessible to the users who are authorized with us. Your information is secured with us 24x7 and is under complete and special care with all the special technologies that we have. We are very much concerned about our server security and that is why we have high security levels for both entrance as well as exit. The 24*7*365 Customer Security Operations System (CSOC) is staffed by experienced certified security analysts. The security analysts use threat intelligence and advanced analytics to detect and remediate threats, based on pre-approved actions. The company uses the latest security technology to deliver the security services, including host and network security. Address the governance, risk and compliance (GRC) with our advanced technology and get yourself free from the burden of compliance response. Employ managed encryption and key management to help protect the data when it is at rest. Our multi-layered approach to securing the cloud services and infrastructure meets the industry standards including ISO 27001. All your important data are backed up under high technology measures ensuring you that your data can be easily recovered in case there is any kind of disaster that might have taken place. We help you get all your data in the proper manner and keep it highly secured. 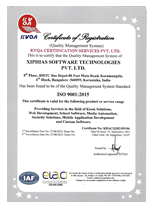 ISO 27001 is considered to be one of the leading international standards that is best for managing the Net security system as well as measure all the information properly. All the relative measures that the company looks after includes the operating procedures, physical security, infrastructure, data management and many such related things. 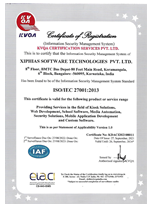 This is a process that has strengthened the entire process of Net Security Management of the company.